The Heat of Reaction at Reference Conditions (0°C and 101.325kPa) is calculated either using the heats of formation of the reactants and the products in the Species database, or the user may specify a Heat of Reaction. These two methods are described in the sections below. The user may display the Heat of Reaction values at 0°C, Feed Temperature, Product Temperature and at a User Defined Temperature. Please see Display Additional Reaction Information . This is the default method used by SysCAD to calculate the HOR. The Heats of Formation at 25°C are defined in the Species database. The Cp values, or equation, is also defined in the Species Database. The Heat of Reaction may be specified as either kJ/kg or kJ/mol. The user specifies the species (reactant or product) to use for the heat of reaction calculations. Custom - The user may specify the temperature, in °C, and pressure, in kPa, for the specified HOR. If the user wishes to override the heat of reaction such that the temperature will not change (ie. Tfeed = Tproduct), then the heat of reaction should be set to 0 at the Feed conditions. If the user wishes to override the heat of reaction such that the sensible heat (HS) will not change (ie. HS_feed = HS_product), then Custom should be used with the HOR value = 0 at 0°C and the unit pressure. Similarly, if the user wishes to override the heat of reaction such that the sensible heat (HS) will change by a fixed amount ΔHS (ie. HS_feed = HS_product + ΔHS), then Custom should be used with the HOR value = ΔHS at 0°C and the unit pressure. Ideally the user should try obtain HOR reference data at 0°C and use the Custom option to specify the HOR at 0°C. If the Standard species model is used then SysCAD will use the Cp data in the species database to calculate HOR at reference conditions. If a Bayer Properties or any user defined species model is used, then SysCAD will use the enthalpies of the feed and product streams from the reaction to calculate the HOR at reference condtions. H2SO4(aq) is used as the example species in this example. The feed to the reaction block contains H2SO4(aq) with fraction = Feed Fraction (which could be zero). For all reaction HOR calculations in the reaction block, the Hf of H2SO4(aq) = Enthalpy at infinite dilution, i.e. fraction of H2SO4(aq) = 0. After all reactions have been solved, the final product stream from the reaction block contains H2SO4(aq) at fraction = Product Fraction (which could be zero). The HOR for H2SO4(aq) at Feed Fraction –> H2SO4(aq) at infinite dilution. If there is no H2SO4(aq) in the feed then this term is zero. The HOR for H2SO4(aq) at infinite dilution –> H2SO4(aq) at Product Fraction. Again, if there is no H2SO4(aq) in the product then this term is zero. If the Heat of Dilution override is selected then RB.dH@0.HtDil.H2SO4(aq) = 0. Note: Also refer to Heat of Dilution. The enthalpy of some gaseous species can vary with pressure (eg. H2O(g) (steam)). Its enthalpy is calculated using its partial pressure which is a function of the total pressure and its molar fraction relative to other gases. The feed to the reaction block contains H2O(g) with PP = PPFeed (which could be zero). The user specifies a method to use for calculating the partial pressure to be used (PPUsed). By default, this will be PPFeed. After all reactions have taken place, the final product stream from the reaction block contains H2O(g) with PP = PPProd (which could be zero). Work.Feed: The HOR for H2O(g)@PPFeed –> H2O(g)@PPUsed. Obviously if there is no H2O(g) in the feed then this term is zero. Work.Product: The HOR for H2O(g)@PPUsed–> H2O(g)@PPProd. Obviously if there is no H2O(g) in the product then this term is zero. No Partial Pressure Override: The partial pressure used will be the feed partial pressure. Total Pressure Method: The partial pressure used will be the total feed pressure. Feed PP Method: The partial pressure used will be the feed partial pressure. (This is identical to not using the Partial Pressure Override). Product PP Method: The partial pressure used will be the product partial pressure. Enviro PP Frac Method: The partial pressure used will be the environmental fraction of the gas (as defined on the Plant Model-Environment page) multiplied by the total pressure. User Defined PP Frac Method: The partial pressure used will be the user defined fraction of the gas multiplied by the total pressure. User Defined PP Method: The partial pressure used will be the user defined partial pressure. 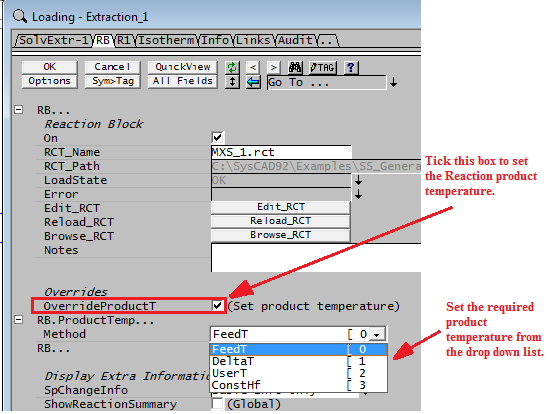 This option allows the user to set the product temperature and remove the requirement for SysCAD to perform and report detailed HOR calculations for the individual reactions and overall HOR. SysCAD still maintains an energy balance and reports the overall HOR and energy added (or removed) to maintain the energy balance across the RB. The advantage of this option is that there is significantly less work for SysCAD and hence an increase in solver speed. This is an ideal option to use when forcing the final product temperature and where reporting of the energy terms such as the HOR of individual reactions is not important. It is more efficient than using the equivalent RB HX or EHX to set the final temperature. The overall Energy Balance of the model is maintained and reported in two places. Firstly at bottom of RB page under the heading "Energy Balance (with product temperature override)"; and secondly by reporting the energy override on the Audit page. This option is similar to using a User Specified Heat of Reaction Override and using one of the Heat Exchange options such as FinalT. Note: When this option is used many of the energy values normally visible (such as heats of reaction) are not available. This page was last edited on 9 May 2017, at 22:55.